The iPhone App Store's arbitrary and inconsistent approval process continues to baffle and annoy on every level, as Macworld Editor-in-Chief Jason Snell just had his iPhone book rejected... for using the word "iPhone" in the title. Apparently Apple doesn't like app names or icons to include the word iPhone or images of the iPhone -- which arguably makes sense on some level -- but you'd think a freaking iPhone reference manual would warrant an exception, wouldn't you? 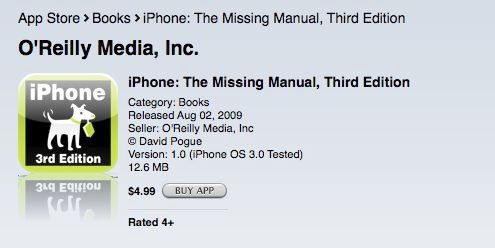 Making matters worse, it appears that one Mr. David Pogue didn't have this problem, as his iPhone: The Missing Manual was approved with title and icon intact. Sigh. Phil Schiller -- deploy!